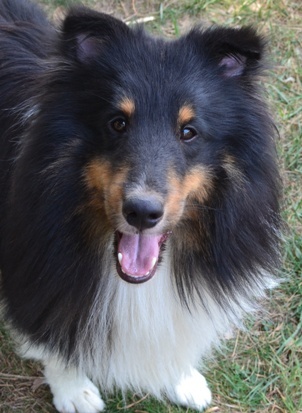 One common trait of the Sheltie is to be very focused on their families. They love to be in the middle of any activity. And I mean ANY. Sitting here typing this page, all my dogs are in the same room with me. If I go to get a cup of coffee, they follow. Have to make a trip to the bathroom? No privacy there either, unless I turn them away at the door. The second I move they are ready to go. I would say they have a high need for love and affection. This is NOT the dog to put out in the back yard to live day and night by itself. It would be miserable. Which is not to say they should never go outside. Their energy level requires some exercise and play. But that is another aspect of the Sheltie that I’ll discuss Sheltie energy on another page. The puppies, still enjoying the freedom of the house are not QUITE as focused on me as the adults. They will wander into another room and cause some disruption in the way of naughty puppyhood. Occasionally, girl puppies go through what I call the "Diva" stage. They are not so enamored with me as they expect me to offer adoration to them. They can become less willing to come bounding up to me when called, standing steadfastly at a distance, waiting for me to retrieve them. They grow out of that and become, like the adults, "velcro dogs". Stuck to me like glue. So, if you are looking for an independent dog in the sense that he doesn't need you around, this would not be the breed for you. There is more to the Sheltie temperament. Do they or do they NOT have a soft temperament? ... but first a potty break for me. Well, maybe all of us.... LOL!